Please check spelling carefully before submitting order as we copy and paste from your provided text. Font, capitalization & layout will be formatted as shown in selected design. 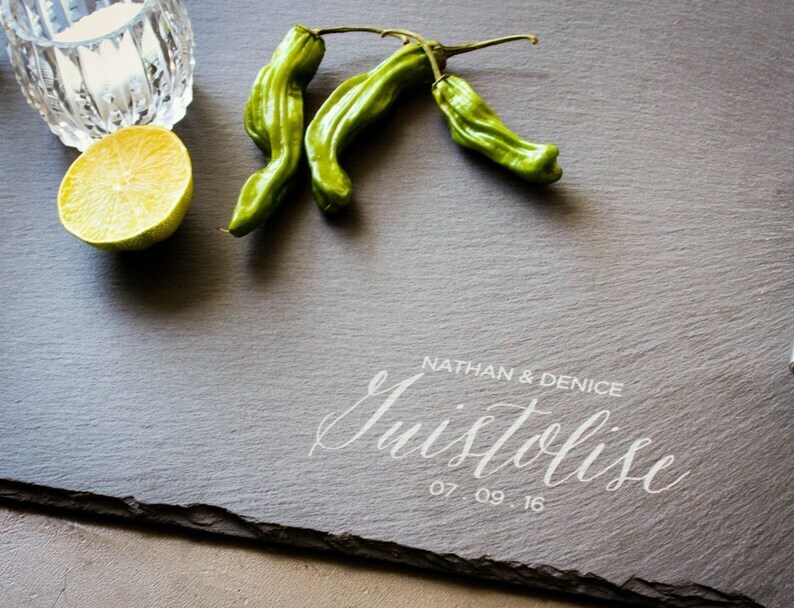 This custom engraved slate serving platter is sure to be a conversation starter for all your gatherings, big or small. It makes an extra special gift for any occasion. • We strive to be ahead of schedule. Items are created in the order received. • A confirmation email with tracking is sent as soon as your order is ready. International orders: Please note that the BUYER is responsible for all import charges in keeping with the laws of their country. We are not registered to collect any taxes or fees outside of the US. I could not be more thrilled with the work of this artist. I purchased a cheeseboard as a Thank You gift, and the design was quite labor intensive. EngraveMeThis was happy to go back and forth, try out different fonts, styles, and spacing options. They never made me feel like I was asking for too much or bothering them with tiny details and changes. The finished product arrived super fast and was perfectly made. Also, the gift recipient was thrilled with the finished cheese board! Looks awesome! I gave it as a gift and the couple loved it. During most of the year, our production is about 3-7 days to ship custom items. During the holiday season, due to the large volume of orders, our production timing of custom orders is in the 1-2 week range. We strive to create all items according to customer requested specifications. However, due to technical considerations, we will use our experienced professional discretion to adjust the size or layout of the graphic if necessary. The engraving text will be copied and pasted from your order notes. Please check your spelling carefully. We cannot remake orders that have errors as a result of mistakes when placing the order. If we make an engraving mistake as compared to the text on the order, we will gladly remake the order. While we have faith in USPS, occasionally items arrive damaged. For replacement, please send us a photo of the item within 5 days of tracking receipt. Wood, stone, and leather are natural products. As such, each item will vary in grain pattern, tone, and reaction to the laser. Our listings include multiple photos to give an example of this variety. We take every care possible to represent the products accurately in our photography. No professional photography or fancy editing is used and all photos taken in our kitchen or back yard. However, please be aware that each screen/monitor can display colors differently. Our photos are taken in extra bright lighting in order to show the engraving. As engraving adds no ink, paint or other coloring substance to the product, it can be difficult to show in a snapshot taken in an average light setting.